Pictured above some of our 70+ volunteers from the Cross Country team hamming it up in front of our banner. We had a beautiful day for Run For Kelli this year. In the end, we raised over $40,000! Thank you to our sponsors, our attendees, our volunteers, and our staff, we definitely couldn’t have done it without you. Click the link at the bottom to see our wrap-up video from Butterfly Productions LLC. Looking for the Results of Run For Kelli? Click the links in right hand column. Run For Kelli was a huge success again this year! We had over 750 registered, 80 volunteers, 12 staff members. Plus all the sponsors, Great American Bagels, Egg Harbor Coffee, Cafe Salsa, Starbucks Coffee, Nix Family, of course, Jimmy Johns sandwiches too! Then there were our sponsors who provided massages Kinesio tape and advice. 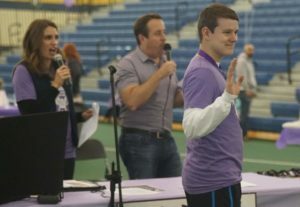 This year the fabulous Ben Bradley from Channel 9 WGN News at 4 PM and the even more fabulous Lauren Petty from NBC Channel 5 news team emceed our event. Sean Harnik one of our 2015 scholarship winners helped by handing out the runners awards. To see more from the Run For Kelli 2018 Click here, we couldn’t fit all the good stuff on one page!